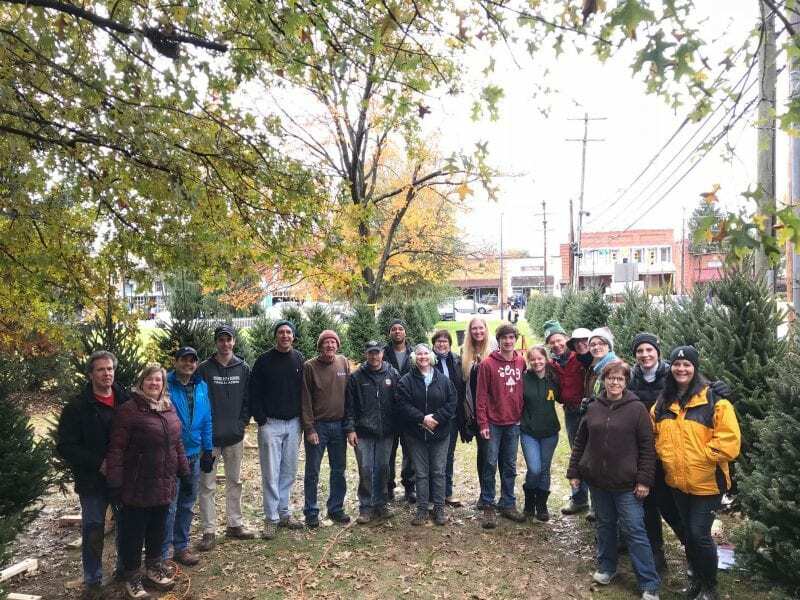 It’s finally here – The trees for the 2018 Giving Tree Village have arrived and Rotary Club of Davidson members, along with family and friends, spent several hours Saturday setting them up. They look beautiful and we are so excited! This year we have 60 trees – 60 sponsors and most importantly, 60 Non-profits — the most we have ever had! Attendees to Christmas in Davidson will visit this most beautiful and popular attraction – The Giving Tree Village and will purchase votes for $1.00 each, in support of their favorite tree or represented non-profit. The non-profit organization will receive 100% of the $1.00 votes in their stocking, plus $100 from the Rotary Club of Davidson. Top vote getters, and superlative winners, will receive additional funds from the Rotary Club of Davidson. This is a significant fundraiser and public relations event for many non-profit organizations each year. The Giving Tree Village has undergone a complete revamping with new signage, a ticket booth, a photo area, options to vote/support non-profits online and so much more. Additional details are available at the website. We also have a Facebook page under the name of Giving Tree Village. Our Celebration, where we present the proceeds to our non-profits, will be at The Hurt Hub, Davidson on Wednesday, December 6 at 6:00 p.m.
See you at Christmas in Davidson!